The Ease, Accuracy, Afford-ability and Reversibility of Genetic Tools like CRISPR That let people change the genetic cards they were dealt. Your DNA is Yours. Period. We’ve worked out a system that allows you to store your DNA on the blockchain in such a way that no one can access you, but you; since you hold the only private key to the data. If you take nothing else from this post, and don’t become involved with this project, please just take this much away. If you ever use any DNA sequencing service, read and fully understand their terms of service. Know exactly what rights you hand over to them. Your DNA has Value. It Can Save Lives. This is why you shouldn’t just lock it up in a safe. We’ve worked out a way that your DNA can remain private – 100% under your control, at the same time it can be used to further what’s known about the human genome. This is by far the most complex part of our project, and it deserves its own video. For now I’ll just say, We accomplish this by doing the exact opposite of what every genetic research project has ever done. We don’t start with a disease, and we don’t seek to create a pill or a treatment. We head straight for the data, and using the power of blockchain mining, we will sort out the roughly 3-million genetic differences between any two of us. Our goal is to turn all of genetic research into a math problem, and solve it. That’s a big deal. You’re Not Stuck With It. I’m here to tell you that some peoples DNA makes them immune to AIDS, or Malaria, or highly unlikely to develop cancers, heart-disease, high cholesterol, Alzheimer’s and even diabetes, and that some people are genetically resistant to the very thing we call aging. Not only that, but there are around 10-thousand more on that list that science is pretty solid about, and some estimates say as many as 50-thousand on top of those that have yet to fully uncovered. My point is this: If you knew that your DNA made you susceptible to some horrible disease, and you could change it…Would you? Assuming you would, the first step is finding out exactly what you’re currently made of by getting sequenced. You can do that, by supporting the AGE project and buying some tokens. We are beginning on the Ethereum network, but we can’t stay there. That platform won’t scale and doesn’t offer the tools we need to succeed – So we’re moving to EOS and doing it ASAP. 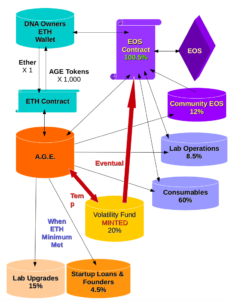 Not only will EOS be able to run our app, but EOS also offers other benefits like the ability to “lease out” your space on the platform when we aren’t running any analysis code against the stored DNA. That means, DNA owners like you won’t have to pay DNA-Storage rent, nor will you have to pay for fresh reports on your DNA, but instead you can actually earn crypto, while storing your DNA and helping improve the human condition. One other piece worth looking at is the Minted Token pile labeled on the Diagram (below) as “Volatility Fund”. These are minted tokens and will be held in reserve to help us stabilize the end price DNA owners will pay to acquire our services. Some organizations might see speculation on their tokens as a good thing. Not us. While it might be great for someone who gets tokens early on (they can get a whole family sequenced for the price of one when the speculators boom the price) those that get in late will end up holding the bag once the speculators flee and crash the value of the token. We intend to adjust the number of tokens a person needs to spend to get their DNA processed and join the Community based on the current valuation of the token (just like the coin base when you are in the process of buying crypto from them) – the price is good for only so long. We hope this coupled with the Volatility Fund will make the speculators move on in search of easier targets. This is important. One example I can give is the recent flurry of people using other sequencing services to locate biological relatives. In some cases, this can be a good thing. In others probably a horrible outcome is sure to take place. There are many more ethical questions to be answered as this technology accelerates. We at AGE don’t wish to be any sort of centralized authority on how issues like that should be addressed. It’s not our place to work out the ethics or even a framework of how to approach the questions that this sort of powerful tech will give rise to. We fully intend to place this responsibility in the hands of the Community of DNA Owners (The people who redeem tokens to get sequenced and stored). Well that about covers where we stand today as far as our token sale. The ERC20 contract is written to reflect what we’ve just covered. We only need to complete a security audit. If you happen to be a solidity security guru and care to get involved, or just want to take a look – please email me. My address: greg.simpson@edna.life. You can also subscribe, friend or follow us wherever you’re reading this document from for future updates and videos about the project. The next video/doc planned is an explanation of how we will store the genetic data on the blockchain so that it is both 100% secure against nefarious uses, and still available to help better conditions and end suffering for humanity.